In 2008, Zimbabwe suffered the second most severe case of hyperinflation in modern history. Its annual inflation reached 89.7 sextillion (1023) %. Prices were doubling each day, making the currency almost worthless. RBZ bond notes have replaced everyday USD in Zimbabwe. The government was forced to scrap the local Zim dollar when Zimbabweans simply refused to use it. Subsequently, the government implemented a multicurrency system based on foreign currencies. But, the U.S. dollar became the coin of the realm. Indeed, even the government accounts became denominated in U.S. dollars in 2009. As a result of this spontaneous dollarization, along with the installation of a new national unity government, the economy rebounded and international trust in Zimbabwe began to be restored. In conventional terms, the value of 1 USD is uniform throughout the world; however, Zimbabwe has pulled every trick in the book in an attempt to disprove that truth. For example, what the Zimbabwean government terms a U.S. “dollar” — a New Zim Dollar (NZD) — is in reality only worth 50% of a real dollar anywhere else in the world. So, how is this mischief possible? T-bills are issued by the government to finance government deficits. These T-bills are unloaded onto local commercial banks that are “coerced” to buy them. It’s no surprise that bankers are anxious about the convertibility of these bonds into real USD at par. Indeed, the bonds maturing from 2019-2020 are already being traded at huge discounts of around 40%. And bankers are not the only ones who are concerned. In April 2017, economist and Zimbabwe Parliamentarian Eddie Cross stated, “This situation is of great concern, the market is discounting TBs by 30 to 40%…There is simply no way the Ministry of Finance or the RBZ [Reserve Bank of Zimbabwe] can redeem this paper or meet interest bills.” In fact, T-bills are currently being redeemed using the RTGS system; however, this policy appears unsustainable. Although bond coins existed on a small scale since December 2014, the introduction of bond notes was significant. These notes were “backed” by a $200m facility from the African Import Export Bank (Afreximbank) — a bank that some allege is unusually close to the Zimbabwean government. Among other things, it has still failed to publish official documents regarding the bond note facility. 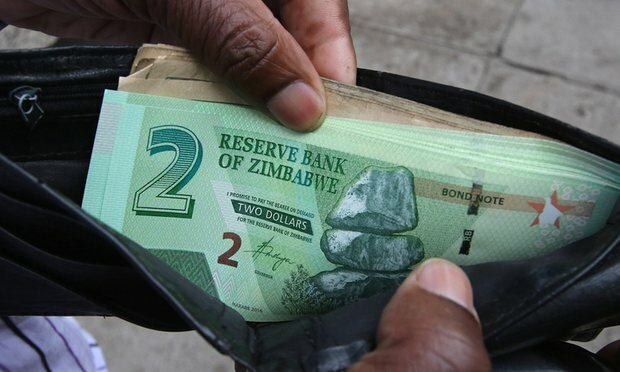 The uncertainty surrounding these bond notes has resulted in a black market for dollars, where the bond notes normally trade at discounts ranging from 5-15%. Not surprisingly, banks have attempted to remove these notes from their books, with bank officials reportedly engaging in black market deals for large cash sums at over 20% discounts!